Maddah, B., Chalabi, H. (2012). Synthesis of MgO Nanoparticales and Identificationof Their Destructive Reaction Products by 2-Chloroethyl Ethyl Sulfide. International Journal of Nanoscience and Nanotechnology, 8(3), 157-164. B. Maddah; H. Chalabi. "Synthesis of MgO Nanoparticales and Identificationof Their Destructive Reaction Products by 2-Chloroethyl Ethyl Sulfide". International Journal of Nanoscience and Nanotechnology, 8, 3, 2012, 157-164. Maddah, B., Chalabi, H. (2012). 'Synthesis of MgO Nanoparticales and Identificationof Their Destructive Reaction Products by 2-Chloroethyl Ethyl Sulfide', International Journal of Nanoscience and Nanotechnology, 8(3), pp. 157-164. Maddah, B., Chalabi, H. Synthesis of MgO Nanoparticales and Identificationof Their Destructive Reaction Products by 2-Chloroethyl Ethyl Sulfide. 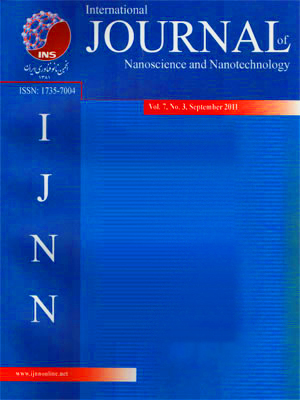 International Journal of Nanoscience and Nanotechnology, 2012; 8(3): 157-164. Nanocrystalline magnesium oxides were prepared by sol–gel method and were characterized by X-ray diffraction, N2-BET, SEM and infrared spectroscopy techniques. The results confirmed the formation of Nano- MgO materials with crystallite size in range of 5-20 nm and surface areas of 336-556m2/g. The product has been tested as destructive adsorbent for the decontamination of (2-chloroethyl) ethyl sulfide (2-CEES), a mimic of bis(2-chloroethyl) sulfide(“HD” or Mustard Gas). Destructive adsorbent reaction has been carried out in heptanes and methanol media. The reaction was investigated by GC-FID and GC–MS techniques. Reaction rate in heptane has been observed to be higher than methanol. It seems a nonpolar media aided material transfer to the reactive surface sites without blocking them.